I'm not sure if the Foreign Secretary was trying to appear thoughtful and statesman-like at a briefing earlier, but in the end he just looked bored. A little glimmer - a flicker of intention perhaps - escaped when he spoke about potential leadership challenges though. He said the PM was the right man for the job "last year, this year and next year". 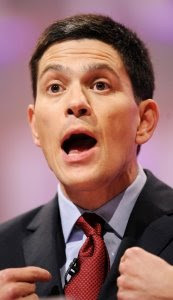 I actually think Miliband would make a good leader, if only he'd have the guts to go for it. But he's clever and comminicates well and has held the foreign secrtary position well. Go GREEN Lobbydog...be reckless...throw caution to the wind....come into the forest and kick off your shoes. You know you want to...I've missed you!